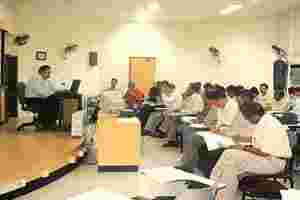 Charting a new course: An armed forces business management class under way at IIM-Calcutta. Kolkata: The sylvan surroundings of the Indian Institute of Management Calcutta (IIM-C) are a far cry from the killing fields of Sri Lanka for Commander Anoop Verma, now a scholarly-looking 46-year-old. As a Marine Commando, the Indian Navy officer won a Vir Chakra, a high order of bravery. Commander Verma and Maj. Mohan are among the 72 officers of the armed forces—men and women, young and not-so-young—who make up the inaugural batch of IIM-C’s certificate course in business management for officers leaving the services. The six-month course was launched by the premier business school in collaboration with the Directorate General Resettlement (DGR), which helps servicemen prepare for a second career after one in the defence services. According to Col. Basudev Mitra, director, resettlement zone (East), the rationale behind approaching IIM-C to launch the course was two-fold. “The army’s promotion structure is pyramidical, with fewer positions available at the higher ranks," he said. As a result, many officers who are still in their mid-50s and still have a lot of service in them have to bow out of the army. “This is the least we can do for them," Mitra added. The army also wants to give the younger short service commission (SSC) officers a good chance at a second career. “Most SSC officers retire in their late 20s and early 30s, after putting in the best years of their youth to the army," Mitra said, and added, “Such a programme will help us attract more youngsters who are, really, the cutting edge of the army." Typically, it is these officers from the ranks of lieutenant to major who lead sub-units in the field, and it is in this segment that the shortage of officers is felt most. “Courses like these would encourage more youngsters to put in a few years at this level where we need them most because they would know that even after opting out, they will have a rewarding corporate career," said a senior serving officer on condition of anonymity. “The defence forces are the best example of the perfect management structure and it is a well-known fact that our officers and men are diligent, honest and very energetic," said Mitra. “With this added qualification, we are sure they will make their mark in corporate life," he added. Said Prof. Sushil Khanna, chairperson of IIM-C’s consultancy and management development programmes: “Combined with the disciplined life in the armed forces, this course will shape them into first-class managers." The course, spread over four modules, teaches the officers business strategy, financial management, marketing and sales, organizational behaviour, human resources management, management information systems, retail, business law, and entrepreneurship, among others. “Our variegated duties in the services have already exposed us to the rudimentaries of most of these topics, now it’s just a question of stepping up to the next higher level," said Col. Basu Dev Banik, 54, who has 30 years’ experience in the Army Ordnance Corp. There are also some officers for whom the course has been a real eye-opener. “I came to know of many subjects and ideas which I didn’t even know existed," said Lt Col. Mandeep Singh, 28, who has led the electrical department of a submarine for four years. The engineer from Noida, who had a number of offers and is now negotiating with diesel engine maker Cummins India Ltd, however, feels that the course needs to be structured better. “We were left with far too much free time when we were prepared to work harder," Singh added. According to Flight Lieutenant Sonali Shirpurkar, 28, from Nagpur, one of the five lady officers in the course: “In the services, management is uni-dimensional because of the strict hierarchy." She added: “No one questions a decision, but in civvy street, we have to be ready to be questioned and, hence, be better man managers." The lady, who was responsible for the maintenance and operations of air defence radars and display systems, among other things, in her six-year-long career with the Indian Air Force, credits the course with helping her excel at this side of management. Brigadier S.K. Deb, a gunner, and the senior-most officer in the course at 55, is all praise for the methodology of instruction: a mix of lectures, case studies, group and individual assignments, presentations and formal assessments. While the services have borne 60% of the course fees, the officers have paid the rest, which amounts to Rs56,000 per head. This is exclusive of the accommodation, which has to be arranged by the officers themselves outside campus, as well as other living and travelling expenses. With the course about to get over, the students are busy with the placements. “There is a happy problem of plenty," said Colonel N.S. Shekhawat, chairman of the placements committee. “Last weekend, Wipro and ICICI Bank were here and shortlisted a number of officers for assignments in various disciplines," he said. Other firms that have either hired students or have evinced interest in them include Cummins India, Mitsui & Co. Ltd, Fino Ltd, a Mumbai-based rural finance application service provider, the Dubai-based Sharaf Retail and Mahindra SSG (Special Services Group), the information security technology consulting business of Mahindra & Mahindra. Many other firms, such as Tata Sons, ITC, Hewlett-Packard, Jindal Steel and Reliance Industries are also expected to visit the students in the next couple of weeks. “Some officers want to go into the NGO sector while others, especially the senior ones, are contemplating starting their own ventures," said Shekhawat. While the officers are cagey about discussing specific officers, Shekhawat said the jobs offered had salaries ranging from Rs8 lakh to Rs20 lakh per annum, apart from perquisites. But what makes them happier is that courses such as these are increasingly helping break stereotypes. “We should not be typecast for ‘security’ jobs and, thankfully, this is happening more and more," said a beaming Banik.